These mostly wood cottages were built with wide shady porches and deep eaves. Tall, shaded windows drafted out hot air at the top and pulled cooler air at the bottom making the homes tolerable in Florida heat. Four artesian wells on the island provided water and according to the company’s brochure, the island water was supposed to have medicinal properties. Islanders lived on fresh seafood from the surrounding waters and a variety of fruits and vegetables from their gardens. Homesteader George Emerson Bean supported his family by selling crops to the soldiers at Egmont Key during the Spanish-American War (1898). 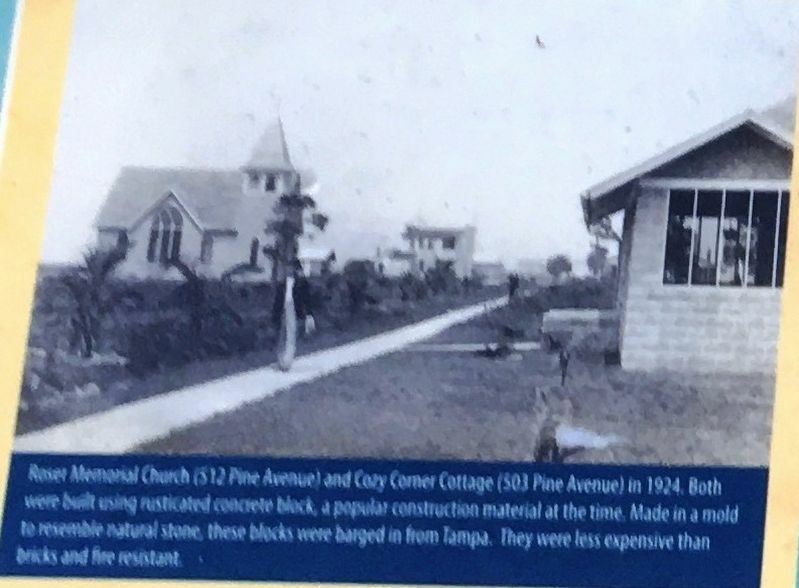 Roser Memorial Church (512 Pine Avenue) and Cory Corner Cottage (501 Pine Avenue) in 1924.Both were built using rusticated concrete block, a popular construction material at the time. Made a mold to resemble natural stone, these blocks were barged in from Tampa. They were less expensive than bricks and fire resistant. Anna Maria Island Historical Museum. Location. 27° 31.789′ N, 82° 44.08′ W. Marker is in Anna Maria Island, Florida, in Manatee County. Marker can be reached from Pine Avenue 0.1 miles north of Crescent Drive, on the right when traveling south. Touch for map. 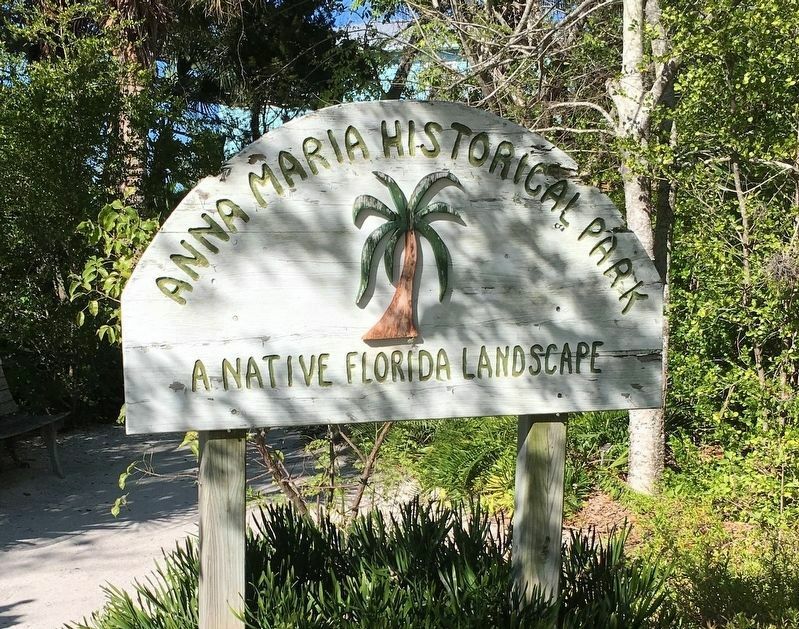 Marker located in Anna Maria Island Historical Park. Marker is at or near this postal address: 402 Pine Ave, Anna Maria FL 34216, United States of America. Touch for directions. Other nearby markers. At least 8 other markers are within 6 miles of this marker, measured as the crow flies. The Homes on the end of The Pier (here, next to this marker); The Old City Jail (within shouting distance of this marker); The City of Anna Maria Historical Park (within shouting distance of this marker); The Island Playhouse (approx. ¼ mile away); The Anna Maria Pier (approx. ¼ mile away); Passage Key (approx. 0.4 miles away); “Bean's Point” / Early Legend (approx. 0.4 miles away); The Village of Cortez (approx. 5.3 miles away). 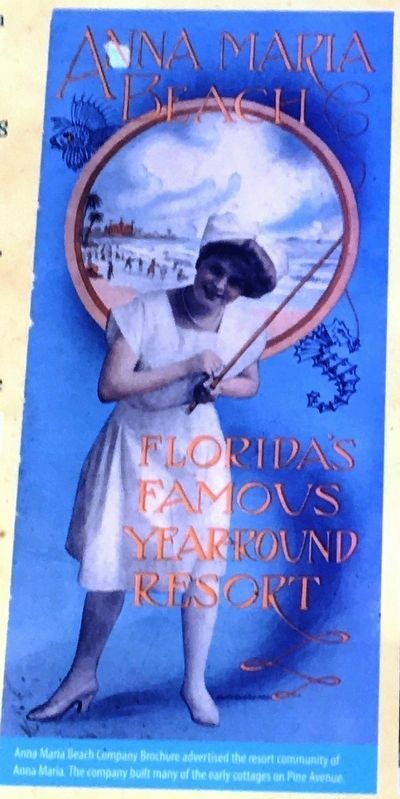 Anna Maria Beach Brochure advertised the resort community of Anna Maria. The company built many of the early cottages on Pine Avenue. Roser Cottage (519 Pine Avenue) in the early 1920s and today (shown below). 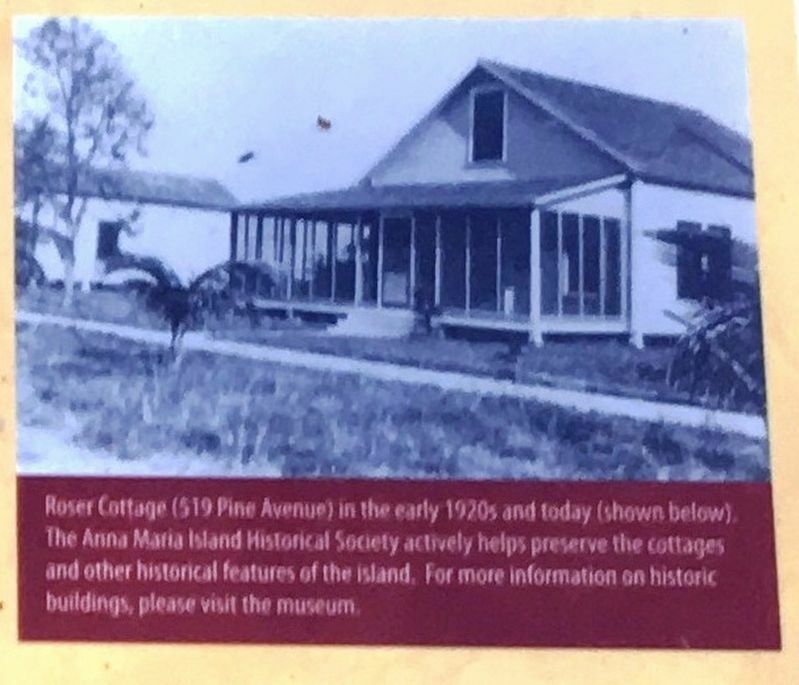 The Anna Maria Island Society actively helps preserve the cottages and other historical features of the island. For more information on historic buildings, please visit the museum. More. 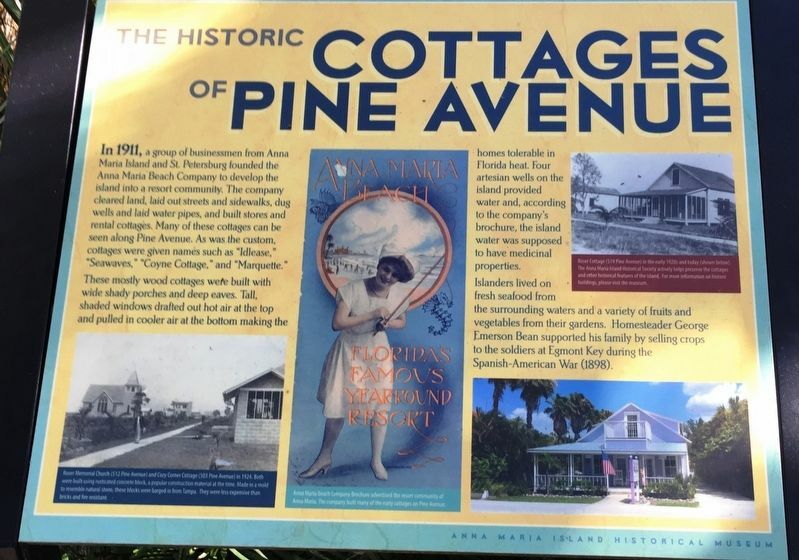 Search the internet for The Historic Cottages of Pine Avenue. Credits. This page was last revised on March 28, 2019. This page originally submitted on March 24, 2019, by Brandon D Cross of Flagler Beach, Florida. This page has been viewed 27 times since then. Photos: 1, 2, 3, 4, 5, 6. submitted on March 24, 2019, by Brandon D Cross of Flagler Beach, Florida. • Bernard Fisher was the editor who published this page.